Over 722,200 sq m of office space is currently under construction across Warsaw as stated in the latest report by the global real estate advisor Savills that summarises first half of the year on the office real estate market in Warsaw. Despite such a high level of new supply the market remains healthy which is proved by a decreasing vacancy rate and a record high letting activity after first six months of the year. “Despite some concerns that large number of office projects under construction city wide will result in a bust, the data shows that so far there is still balance between supply and demand. The office market in Warsaw is still ready to absorb new projects hence developers’ activity is high. The risk of rising vacancy level is a concern mostly for older buildings as tenants prefer to choose new projects. Owners of older buildings will be forced to refurbish existing office space or even decide to demolish them and use the plot for other purposes” - says Tomasz Buras, Managing Director, Savills Poland. As stated in „Market in Minutes – Office market in Warsaw”, almost 722,200 sq m of office space is currently under construction. In the first half of the year 131,400 sq m was completed. The largest office project completed during that time was the second phase of Business Garden complex, which comprises of four buildings totaling 54,800 sq m. During the second half of the year another 185,000 sq m of office space is expected to be delivered across the city. Thus last year with record high new supply of 407,000 sq m in such projects as Warsaw Spire and Q22 among others, won’t be beaten. Starting next year, throughout the three following years, the largest currently under construction office complexes will be completed: Mennica Legacy Tower (63,800 sqm; delivery date 2018), The Warsaw Hub (75,000 sq m; delivery date 2019) and Varso (106,200 sq m; delivery date 2020). According to Savills, letting activity in the first half of the year in Warsaw was at record high level. Take-up stood at 391,400 sq m which was above the total volume during the first six months of 2016 (360,600 sq m) and more than the historical-high level recorded in 2015 when 390,200 sq m of office space was leased in H1. 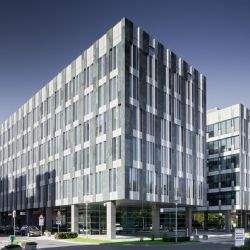 30% of letting activity was recorded in the City Centre, which contains four subzones, including City Center West located in the Daszyńskiego roundabout region, where 76,700 sq m of office space was leased. Take-up in Mokotów in H1 stood at 87,300 sq m, of which 60,400 was leased in Służewiec. Finance institutions dominated the largest letting transactions in Warsaw in the first half of the year. Three out of five largest lease deals was signed by companies from banking sector. The largest transaction was Millenium Bank’s renewal of the lease agreement for the office space in Millenium Park (18,900 sq m). Prime rents in projects located in the CBD and City Centre range from EUR 21.00 per sq m/month up to EUR 25.00 per sq m/month. Prime rents in non-central districts range between EUR 13.00 and 14.50 per sq m/month. The vacancy rate decreased by 150 bps to 13.9% when compared with H1 2016. “Warsaw still remains the largest office market in Poland and also the most attractive city for developers and tenants. The high level of new supply doesn’t mean there too many projects under construction in Warsaw. But without a doubt the competition on the market is increasing which is why developers build more and more interesting projects and try to attract tenants by developing more and more interesting projects with amenities” – Dorota Ejsmont, Head of Office Agency, Landlord Representation, Savills.